This watch demonstrates perhaps the perfect blend of stealth and bold at the same time. 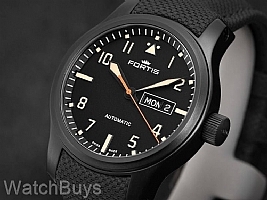 To design this new watch, Fortis started with a black PVD case of 42 mm. Then, using a combination of beige SuperLuminova on the hour and minute hands, hour markers and indices they decided to add a touch of red with the seconds hand. We also like that Fortis took the time to add a day feature to this watch. The day/date display is at the 3 position with the day display in either English or German (you change the settings through the crown). This watch is fitted with a black Fortis Performance Series strap which has an integrated design leaving no gap between the strap and case. Verified Owner Comments: When I unboxed this watch, I was wearing my Girard Perregaux Competizione Stradale in SS with matching bracelet. It has bling and class. So, I was initially underwhelmed. Then I looked closer and discovered many details. Applied numerals in a tan color lume. Applied hour marker notched into raised edge of dial. I took both watches into a dark closet. Now the advantage was all Fortis. Clear and visible hands, numbers and markers. Perfect!! Verified Owner Comments: Very pleased with my first black watch. The dial is captivating to look at. The beige/tan Arabic hours and hands are really a great color. Fitted strap a nice touch, and another first for me. Again, very pleased. Verified Owner Comments: This is a very well made watch with a great finish and a day/date function. The strap is very well integrated into the case but at the price it should have a deployant strap not a buckle. The only other issue I have is that the crown is not a screw-in type. Although the watch claims it is water-resistant to 20 bars, which is described as 200 meters, that seems to be a bit misleading. This is NOT a dive watch and anything other than a quick swim in a pool would be risky. WB Comments: Thank you for your review. Please note however that this watch is in fact WR to 200 meters as stated and does not require a screw down crown to achieve this rating. 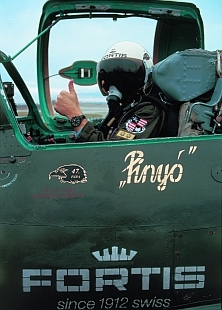 Further, it is not marketed as a diver's watch but a pilot's watch as it is part of the Aeromaster Series.